Whenever a disaster strikes your store, you need to be back in business, operating at full speed as soon as possible. Otherwise, every day your store remains closed means a loss of revenue and customers for your business and your staff. But thanks to the experts at ServiceMaster Recovery Services and our network of resources, you can depend on us for all of your restoration needs in order to bring your business back to normal. Not only do we have experience in content restoration and cleaning, we also have the means to get this done around the clock. If needed, we can even section off parts of your business so that your business can remain open and operate in the space that was unaffected by damages. ServiceMaster Recovery Services offers you all this and more. 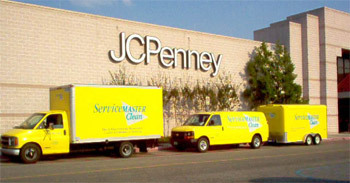 We have managed the recovery of several retail stores through our nationwide network disaster restoration professionals. These resources containthe support of a $3 billion company and a network of more than 600 locations. This allows us to answer your disaster restoration calls quicker, better project management, and getting your retail store repaired as soon as possible. In the end, at ServiceMaster Recovery Services our job is to get you back into yours as soon as possible.Restore your peace of mind® with ServiceMaster Recovery Services.